Long ago there was a football team in Baltimore. And then there wasn’t. For a very long time. And people were bitter and angry. For a very long time. There is irony in the tale of Baltimore’s football history. When our team was moved to another city, we the people became mightily indignant. How could he (the owner who still shall not be named) take the team, the franchise, the legend and lore and transplant that someplace else? How could he? How DARE he? Yes, we were angry for a very long time. Twelve years to be precise. And then, and here’s where the irony comes in, Baltimore took another city’s team. We the conquered had become the conqueror. However, understanding the vitriol focused on the owner who still shall not be named, and the lawsuit that needed to be settled before he moved the team, Art Modell wisely chose the leave the identity and history of the Browns where it belonged, in Cleveland. In 1996, the Ravens came to Baltimore. And the people once again had a team to cheer for. We’ve had winning years. We’ve had losing years. And we’ve had years we should have won but didn’t. This year it looked like we had a solid chance at another trip to the Super Bowl to go for a second Lombardy Trophy. Hopeful optimism spread through the city. Fans donned their purple; the city was lit at night in hues of violet. And in what was to become the Raven’s final game of the season, I sat in front of the Tivo and watched the wheels come off the bus. The saving grace of the evening was the bottle of wine I was using to numb the excruciating pain of the second half in which they threw away their lead, and a enormous bowl of sweet and spicy snack mix I had whipped up to nibble on. Reaching for snack mix, or the bottle of wine, gave me something to do with my hands besides wring them in desperation as the minutes ticked away and the end of the season came into view. I won’t lie. It was a painful loss. But out of the ashes of the 2010 Ravens season, Sweet and Spicy Snack Mix was born. It’s not quite the same thrill as having another Super Bowl win under our belts, but it’s better than nothing. We’ve had nothing. And it tasted bitter and angry. Inspired by My Morning Chocolate’s Adaptation of Cooking Light’s recipe. BAH Note: I can’t eat popcorn or nuts so when Jen of MMC suggested substituting cereal, I knew I had to try this. It’s sweet and salty and spicy…my perfect trifecta of flavors. I initially thought this would make a great holiday hostess type gift packaged up in a nice big mason jar. But learn from my experience. Putting Sweet and Spicy Snack Mix in an airtight container is a sure recipe for soggy SSSM. It needs to breathe. Also, don’t be tempted to use the “butter” pretzels because they may be less expensive than plain old salted pretzels. They will impart a fake, movie theater butter flavor to your mix. And that’s just wrong. Please remember that the spices can be used, or not, in any combination. Line a half sheet pan with parchment or aluminum foil and set aside. Combine the pretzels and cereal in a large bowl. Use your hands to mix it well. In a medium saucepan, combine the brown sugar, maple syrup, butter, salt, and spices. Cook over a low flame until the butter and brown sugar is melted. Taste for seasoning and add more sugar, spice, or salt as desired. Once the flavor of the sauce is to your liking, increase the heat and bring to a boil. Cook for 1 minute, stirring constantly while the mixture bubbles furiously. Carefully remove the pan from the heat and cool for 1 minute before adding the liquid to the cereal in several additions, stirring between each with a wood spoon or plastic spatula. Remember, boiling sugar is molten hot. Once the syrup has been mixed in to the cereal, spread the mixture into your prepared sheet pan and allow to cool for 5 minutes before digging in to the sweet spicy mix. Don’t remind me of the ravens pain! Sorry to bring back the pain of the season. 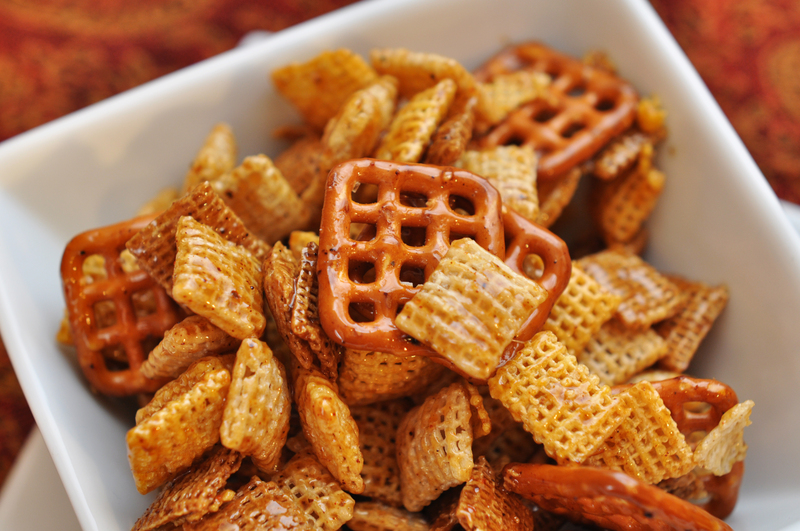 But don’t let that stop you from making some sweet and spicy snack mix. Jennifer, S3M is an equal opportunity snack…enjoy. Oh man, that was a rough Ravens loss. But on to next year! I’m selfishly glad you tried to package this recipe because now I know it can’t be done. But it’s good to know that the spice mix works well with cereal. Did you think the end result was sticky? Jen, we can dream of better days next season. Lesson learned…S3M needs to be consumed promptly. The mix was a little sticky, but in that good way that makes you want to lick every last bit off your fingers. We literally could not stop eating it. Even after a very satisfying dinner. It was simply irresistible. My husband is a huge Ravens fan and shared your pain, Wendi! Then please make some of this to ease his pain. You can claim dibs on the wine though. it really was a painful game, wasn’t it? i may have taken to twitter and wailed in anguish over it. Lan, I had this but I also had a $hitload of carb calories in addition to a painful season ending game. I love chex mix, so much I could probably not stop eating it until the bag is empty! Darn you wendi for making me crave salty snacks! Elizabeth, I share the blame for your salty snack craving with My Morning Chocolate. I’m sorry about the Ravens! We had a sad time watching the Bears lose as well . . . but since most of my extended family lives in Wisconsin, seeing the Packers take it to the top wasn’t so painful after all. =) Your snack mix looks delightful. Jenna, I won’t lie…I was overjoyed that the Packer’s won. There’s always next season. I’ll pretty much eat anything with Chex cereal in it so this is a win in my book! Brooke, I think you need to whip up a batch of this SOON. Be warned, the recipe makes a lot. So have other mouths there to help lighten the load. Mayflower Moving trucks still upset me. Oma, you know the pain of which I speak. Lots of people here still carry the wounds…our memories run long and deep. For instance when the team of the owner who shall not be named plays here, I don’t think they announce the actual team name at the stadium. Or maybe I’m just making that up or got that second hand from someone since I’ve never actually been to a game where those teams were playing. I’ve hired movers many times over the years and I will never be able to bring myself to use Mayflower for the very same reason. oh i could eat a bucketful of this! with beer, of course! Jaden, wine was my beverage of choice the day I made this, but I think a nice cold beer would go just as well. Thanks for stopping by.